Welcome to the website of MBS Wood furniture factory. Here you will find the detailed information on our company, our furniture e- catalog and our prices. The main direction of our work is manufacture of oak wooden furniture. We offer favorable terms for cooperation for our customers. We use modern equipment and high quality materials for wooden furniture manufacture. High quality kitchen and dining furniture: oak dining tables, dining tables with metal legs, dining tables with wooden legs. The best price offers for wholesale buyers. Please, send us a request by e-mail and we will send you our wooden furniture and metal legs catalog with the prices. Our wooden tables will be a perfect choice for your kitchen, dining room, living room as well as the office or restaurant. The finished goods are stored in the factory furniture warehouse. We have a lot of natural wood furniture in stock. Send us the order and we’ll deliver the furniture from our warehouse to your place immediately. Furniture manufacture is divided into several stages. 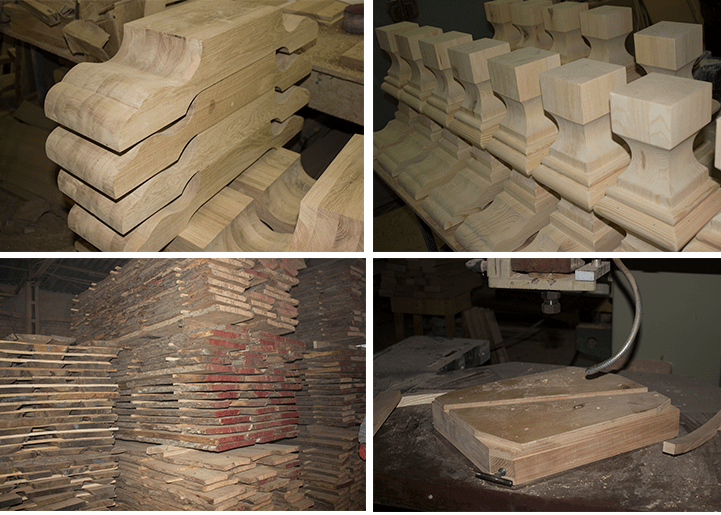 We have a full production cycle which begins with preparation of wood and ends with the final product manufacture. Due to the full production cycle our furniture factory can provide low prices for our products for the wholesale buyers. We can organize delivery of small batches of wooden furniture to your warehouse. We manufacture wooden tables from solid ash and oak. For tables production we use modern equipment. We carefully select raw materials for production and adhere to ISO9001 standards. We carefully select wood and metal raw materials which have the appropriate quality certificates. We export the products manufactured by our company to the European countries. Due to our high capacities we are able to manufacture big volumes of wooden furniture. To receive a free catalog of our furniture, please, send us a request or download it from our website. To receive the news and updated prices from us, please, subscribe to our newsletter. MBS WOOD is a vertically integrated company combining all the manufacturing stages. To produce our wooden furniture we choose only ecologically clean and high quality wood grown in the Ukrainian forests. 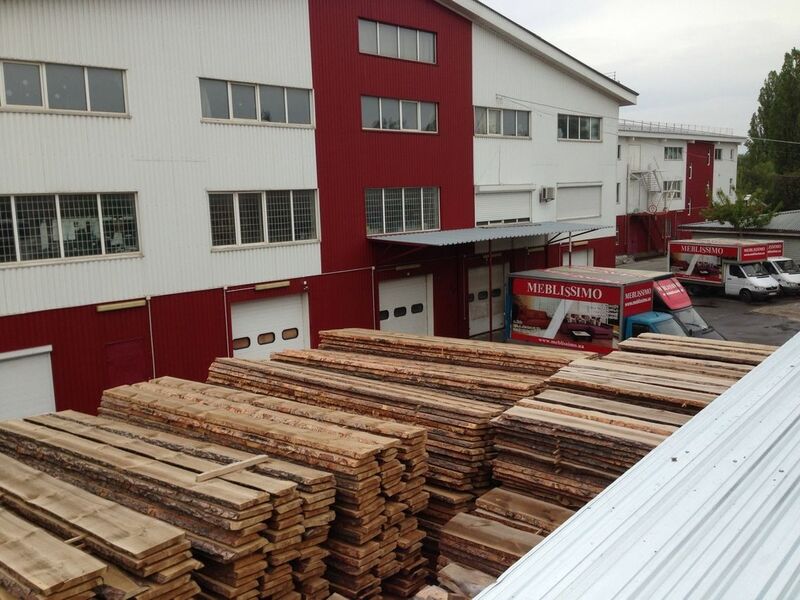 We purchase the wood upon its careful selection and verification of all the documents from the state forestry, confirming the environmental friendliness and quality of the wood. The wood is processed on our own sawmill. Wood drying is automatically controlled. It is conducted in the specially equipped drying chambers. Our production capacities and modern woodworking equipment allow us to produce a great number of furniture in a short term. Our factory also produces metal constructions and legs for tables. The finished metal constructions are coated in special chambers. For coating we use the powder paint. The finished products are carefully packed for the further transportation. We pay special attention to the quality of our products. Our product line is updated and improved on a regular basis. We have big production facilities and modern equipment. More than 150 employees work at our factory. 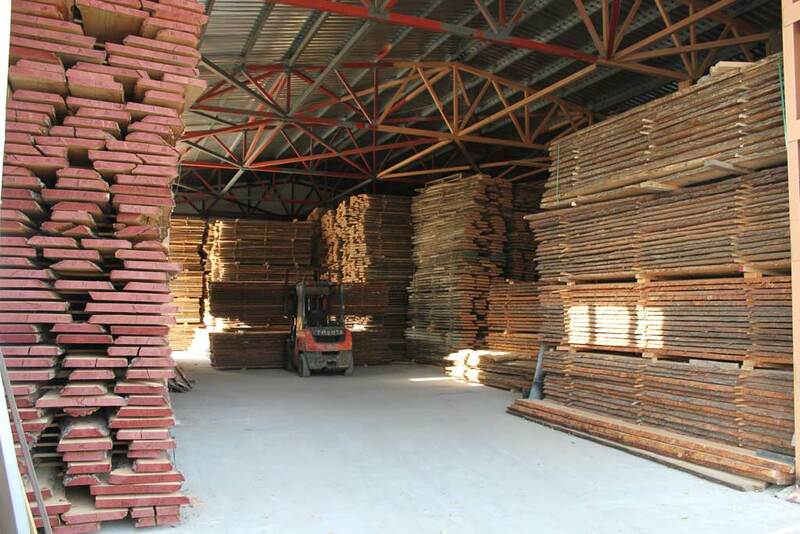 The wood is dried in specially equipped premises. We adhere to all the standard procedures and norms of wood drying. We manufacture our furniture from oak, ash and pine. We export our products to the European countries. We transport our goods by the road transport. The delivery cost is calculated individually for each buyer. MBS Wood furniture factory manufactures dining tables and coffee tables made of high quality solid natural oak. We offer a wide range of wooden tables of various shapes and sizes. The legs for wooden tables are made of metal (steel). We produce the legs for dining and coffee tables of the great variety of shapes. MBS Wood manufactures wooden home furniture. Today the main direction of the factory is production of vintage tables with metal and wooden legs. Our products purchase the buyers from the Netherlands, Germany, and Denmark. We manufacture beautiful and high quality wooden furniture and export the furniture to Europe. For more than 25 years we have been successfully manufacturing our furniture for your homes. We cooperate with wholesale buyers and with large online stores in Europe. We offer favorable terms of cooperation for our regular customers. We’ll be glad to cooperate with the owners of large furniture stores and distributors of furniture in Europe. We are constantly expanding our capabilities. We are regularly upgrading our equipment. We add new products to our model range. We are ready to manufacture wooden furniture according to your drawings. Our production capacities allow us to manufacture great volumes of the goods. We have a full cycle of wooden tables production. The whole cycle includes the following steps: wood sawing, wood drying in special drying chambers, wood gluing and processing to receive the desired size, wood coating with special oil. We offer low prices for the entire range of tables made of natural wood. We guarantee the high quality of our products. You can order table tops made of natural wood of non-standard sizes. We can also manufacture metal table legs of any shape and any size upon your request. We have a lot of buyers in Europe: Germany, Denmark, Poland, the Netherlands. The owners of big furniture stores are purchasing mainly our wooden furniture. We conclude a contract on the furniture manufacture with each buyer. In 2018, we started manufacture of natural oak tables for outdoor use. On our website you can get all the necessary information, download the price list and catalog of our products. We manufacture wooden tables. We use only environmentally friendly materials for our tables production. We manufacture both standard and not standard size furniture according to your pictures, or photos. 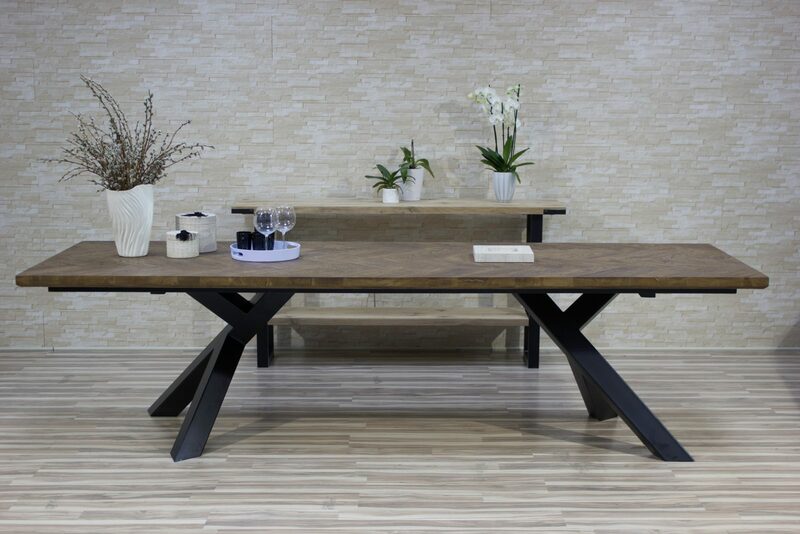 The gallery will help you to make a choice of a table made of solid wood. Usually we associate home comfort and coziness with a huge table gathering all the relatives and friends together in the evenings. Our specialists will make such a table for you according to your own drawing or upon your request taking into account all your remarks. We can guarantee its convenience and reliability. We also offer office, writing, coffee and other types of tables manufactured at our factory. Classic wooden tables have always been in fashion. We will help you to choose any table for you so you’ll be able to buy the table you really need and like most of all. A unique table, made in accordance with your wishes will decorate your home, office or any other room. You will be satisfied with its quality for many years. Ordering the table at our factory you can be sure in its quality and comfort. Dining tables made of natural wood have always been famous for their durability and beauty. Especially popular are oak tables, because their strength is tested for centuries and cannot be compared with any other material. Since the old times people have used solid oak for furniture. Today the wooden furniture in the house is a sign of good taste of the owner. You will not find oak tables everywhere, but if you had to have lunch at it, you can be sure that the food will be much tastier. Energy and purity of natural materials, which are used for the production of wooden furniture, fills the room with peace and harmony. Therefore, at the oak table, guests can always relax and get the most out of the meal! This furniture will perfectly fit into the interior of a cafe or restaurant, it is not exposed to moisture still it is resistant to mechanical damage, which is very important for public institutions. 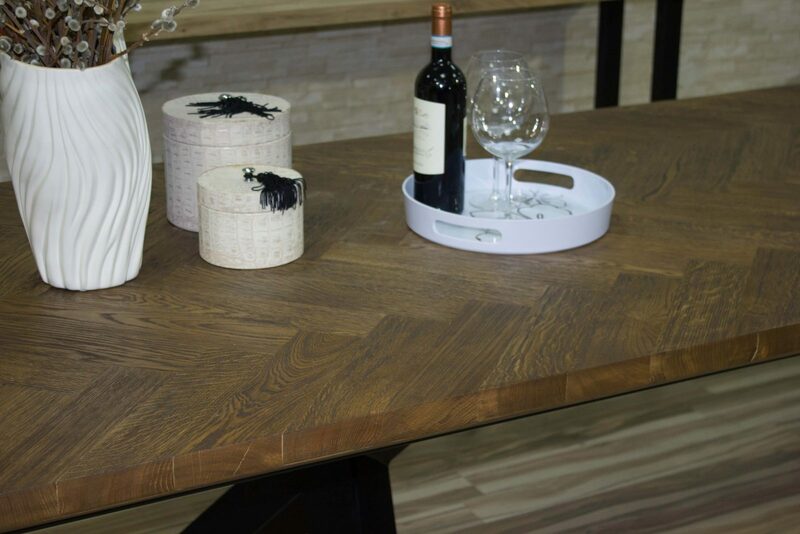 Moreover, the solid oak is very durable, so the products from it can be of impressive size. This will allow one table to accommodate a large number of guests. 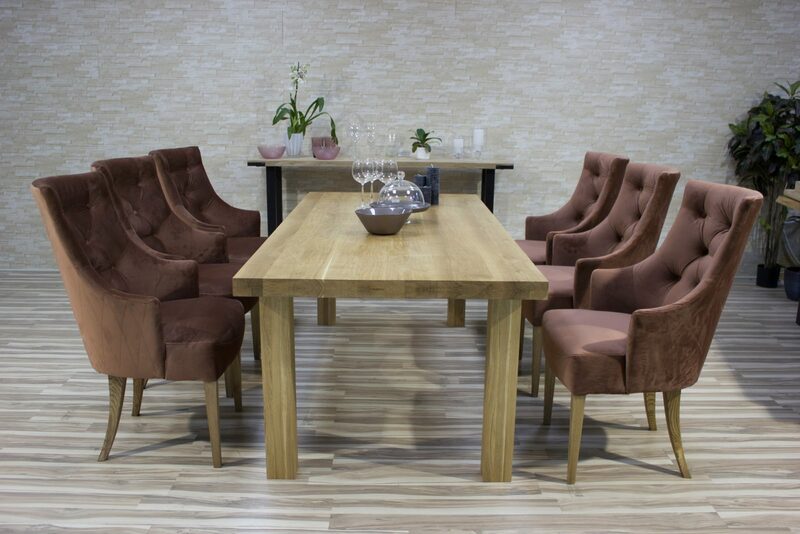 If you value tradition, reliability and stability, want to create a sense of comfort and warmth in your home, then we recommend to buy a dining table made of oak. It will be the Keeper of the hearth and will serve you for decades. We manufacture oak tabletops. The wooden tabletops can be combined with different tables: dining tables, office tables, coffee tables, restaurants tables. We observe all the production technology norms for manufacture of the wooden tabletops. We choose the wood of high quality for our tables. In special cameras the wood is dried in such a way that the humidity level is about 8-10%. The wood for tabletops is sawn by the special woodworking equipment. We offer our buyers several types of tabletops (stuck together board and integral board). Each tabletop is processed manually, covered with special oil. Afterwards in the lower part of the tabletop we make universal fastenings for table legs. 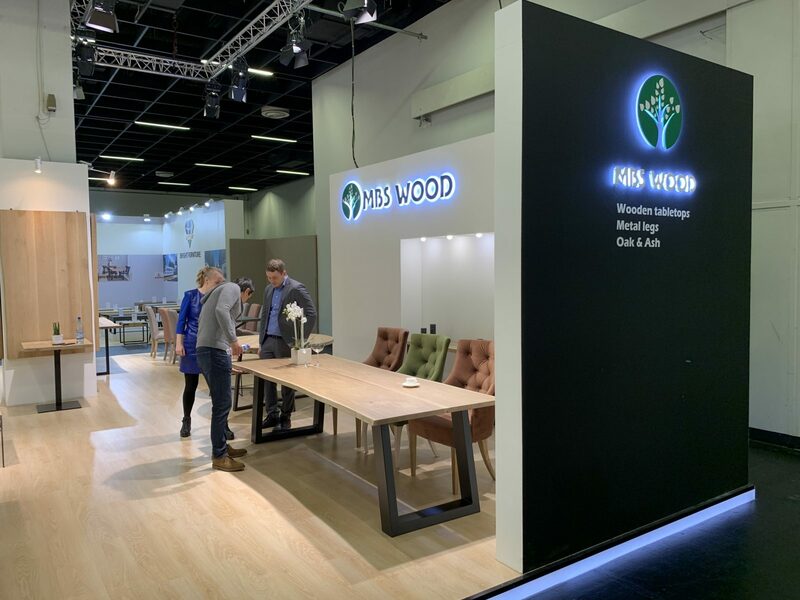 Our wooden tabletops are manufactured taking into account all the special requirements of the buyer (it is possible to change the fastening design or general size of the ready tabletop). Our furniture factory produces metal legs for tables. We offer several types of table legs: wooden legs and metal legs. You have an opportunity to order table legs made of iron or stainless steel. The metal legs made of iron profile pipe are presented in our catalog. You can order production of wooden legs for tables from natural wood at your choice (ash, oak, pine). We cover wooden table legs with special oil and offer many colors for you to choose. We cover metal legs for tables with transparent varnish as well. We also cover metal legs with powder paint, which is more resistant to mechanical damages. The separate direction of our company is production of coffee tables which will be a perfect choice for your drawing room. We offer two types of coffee tables: with wooden legs and with metal legs. 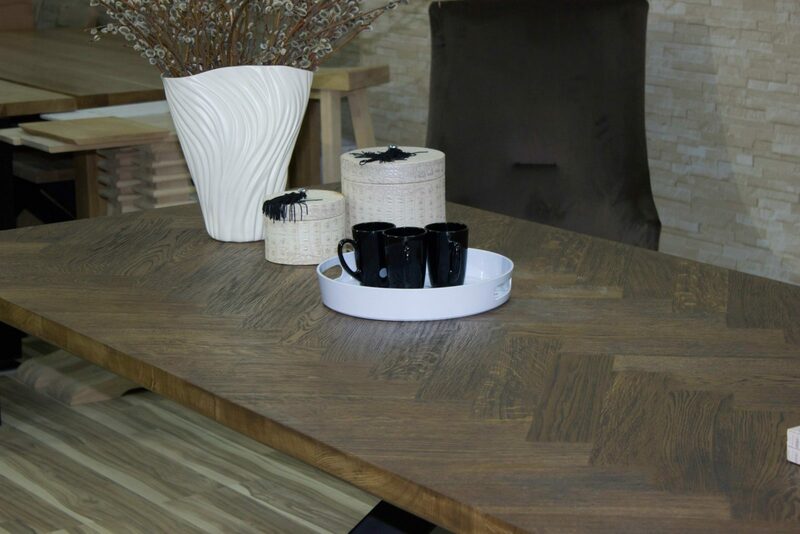 Coffee tables made of oak massif look very beautiful and perfectly suit any interior. You can have a look at ready coffee tables in the section–Our Factory Production. We store all the wooden furniture in our warehouse. Our warehouse storage conditions correspond to the required storage conditions for wood (air humidity, temperature, etc.). We have a large number of tables of different size which we can be delivered to you right upon your order. 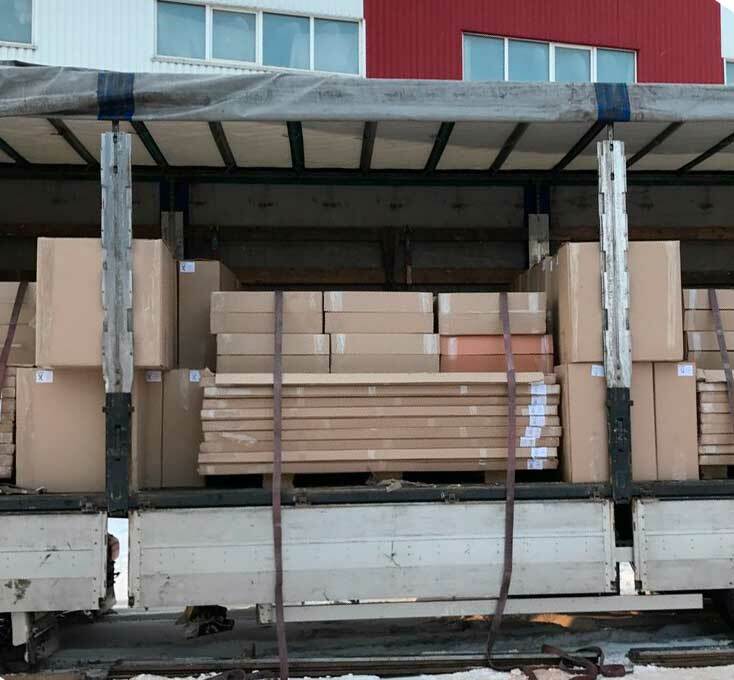 If you want to make a big order, please, contact our manager to coordinate the delivery terms.